If you grew up in America in the 80's then it would've been nearly impossible if your life wasn't touched in the slightest by at least one of John Hughes' films. In fact, it might even be fair to say that his films can be seen as synonymous to American culture during this era. His movies not only gave comfort to those of us who were going through some right-of-passage-adolescent-angst, but they also gave us hope that in the end, there would always be vindication through some hard and confusing times. 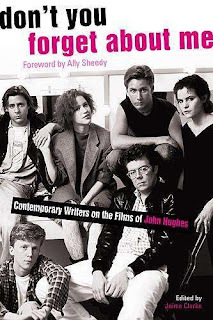 I thought it might be fun to go back to John Hughes lane with you, not just to commemorate the man's work, but to commemorate scenes that at times defined how we viewed our world growing up in America in the good old 80's. Who can ever forget this dance fever performance of Ducky lip sinking to Otis Redding Try a Little Tenderness from Pretty in Pink. The boy plays a dork in the film, but when he steps into this character, he certainly transcends into a very slick and cool kinda a guy. This is when we get a first glimpse in the film that John Bender, (Judd Nelson's character) comes from a very disturbing and abusive family--explaining his rebellious indignation towards authority as well as his peers. This is the critical section from She's Having a Baby when Jake, (Kevin Bacon's character) has a cathartic awakening to the fact that he is after all very much in love with his wife. Unfortunately for him, it took her near death experience with their unborn child to arrive at this crucial revelation. Who can ever forget Weird Science. It's just your typical story of two dorks who end up creating "a girl" as they refer to Lisa played by Kelly LeBrock. She not only turned their lives up-side-down, but she also managed to teach them a few lessons on manhood along the way. Check it. And this scene...This scene certainlyly needs no introduction, it is the finale of Sixteen Candles, and it is what some of us AS young girls lived for whenever we got together for our yearly gathering to watch John Hughes films with our girlfriends.